Liquid waste is big business, at least for longtime industrial services company Plummer’s Environmental Services in Byron Center, Michigan. And like any region with manufacturing and industry, this area has a lot of it. Sources of liquid waste include common manufacturing and industrial processes where equipment is cleaned and degreased with solvents and detergents. Although liquid waste like this isn’t considered hazardous, local, regional, and federal governments do regulate how this waste is handled, and companies must collect and dispose of it carefully. This is where Plummer’s Environmental Services gets involved. The company collects and disposes of liquid waste generated by factories and other industrial customers. Clients temporarily store the waste on site until Plummer’s transfers it into a tanker truck and takes it to its own treatment facility. There, the liquid waste is pumped from the truck into a 65,000-gallon holding tank until the company can treat and dispose of it. This last step was causing big, messy problems. Before pumping the liquid waste from the tanker truck into the holding tank, an operator first had to confirm there was enough space to hold the liquid waste from the truck. The only way to do this was to physically look into the top of the holding tank, check the current level, and then estimate if there was enough space for the contents of the tanker truck. Sometimes the estimate was wrong and the holding tank would overfill into the containment area, leading to a mess and expensive cleanup. Opto 22 integrator Perceptive Controls soon had an answer to the problem. The integrator installed an ultrasound tank level sensor at the top of the tank and connected it to a SNAP PAC R-series programmable automation controller. When the tank level reaches a predefined high point, alert lights, alarm horns, and even email messages are triggered to alert personnel that the tank has reached capacity. Finally, an IP camera mounted at the top of the tank provides a realtime view of the tank level. 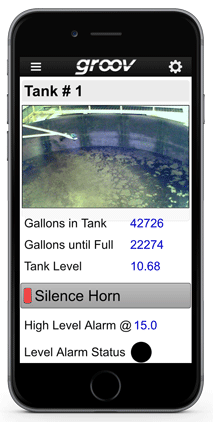 Using Opto 22’s groov mobile operator interface system, live video from the camera plus tank level data are available on operators’ smartphones and tablets. The holding tank application will have three phases. Phase 1, now complete, is monitoring and alerting only. Phase 2 is underway and will control the pumps that move the liquid waste from the tanker truck to the holding tank and automatically shut off pumps before the tank can be overfilled. In phase 3, Plummer’s will install this tank monitoring system at their customers’ holding tanks. 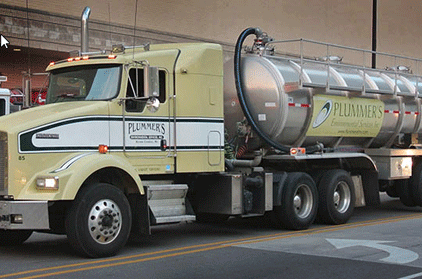 With realtime information from a customer’s site, Plummer’s can dispatch a tanker truck to unload the customer’s tank before it fills up and disrupts production lines. Messes are avoided and business is improved.